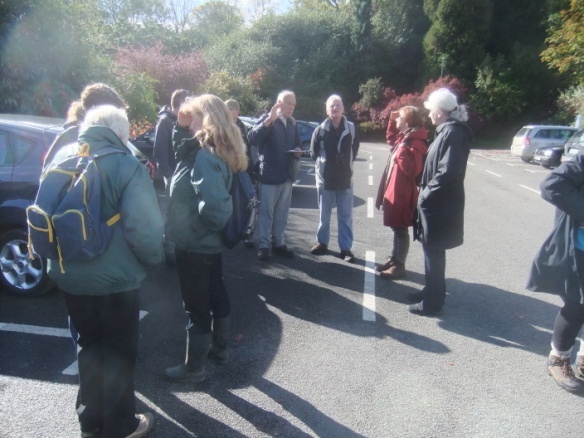 21 Member and friends met at the car park at 2pm. It was a lovely sunny day, which put everyone in the mood for a good forage. Roy warned everyone of the dangers of eating any wild foods unless they were completely confident of the identity of it themselves. 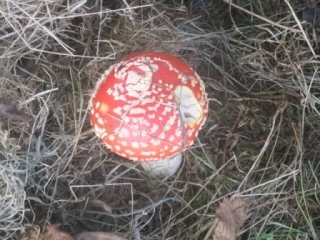 He pointed out that some fungi need scientific analysis to precisely identify them. Roy encouraged everyone especially the beginners among us to look, photograph but not to taste, unless you were one hundred percent sure of what you were eating. We set off looking at all the fungi, plants and birds, which were plentiful in this beautiful park. We were surprised how many different fungi were there to be found (list below). Roy had a lot of identification to do while Frankie went ahead to find the next fungus, some of the members were very quick to find plenty more for Roy, who gave us as much information as he had on each specimen. This is a photos of one of them. We spent two wonder filled hours doing a walk that usually takes about half an hour. We eventually made our way back to the picnic area where we had another look at some of the specimens, which we had collected in a basket. Roy again told us that he does this for fun and not for consumption, as it is very easy to confuse the poisonous, with the nonpoisonous. We then met up with Christopher Wilson & Alan McGuire who were recording for their radio program, but couldn’t find us while we were out foraging. Woody Nightshade, Gilda Rose, Safron Milkcap, Deciever –(pink gills can be white), Brown roll rim – (flesh turns brown, Highly poisonous), Clouded Funnel, Citrine Waxcap – (white/ green gills), Slippery Jack – (jelly like spongy), Blusher –club stem, Pixicap, Glistening Ink Cap- (they dissolve in a day), Oakbug Milkcap – (smells like engine oil), Charcoal Burner – (Looks like its name), Micena Porcline –(on a beech branch), Bonnet Cap, Pleated Ink Cap, Haycap, Common Funnell, Amythist Deciever – (Purple), Wrinkle Cup, Buttercap, Fiber Cap, Sulphur Tuff, Earthball Smooth, Funnell- Pinkgill? –(under variegated cerris oak), Dark Purple Brittle Gill, Brown Birch Bolet, Burnt Knight, Webcap SPP, Sickner, Ocre Brittlegill, Shaggy Inkcap, Beech Milkcap, Lilac Bonnet, Candle Snuff, Honey Fungus, (root forms bracket) Then Roy pointed out the Blue Legged Brownie which is an import and comes in on woodchip, which of course, is where he found it. Sorrell, Dandelion, Blackberry, Hawthorn, Lime, Nettles, Hazelnut, Fools Watercress, Angelica, Meadowsweet, Raspberry, Sweet Chestnut, Beech, St Johns Wort, Acorns, Oak, Silverweed, Selfheal, Polypody, Bramble, Wild strawberry & Wood Sorrel. Wren, Common Darter, Robin, Meadow Pipit, Goldcrest, Wood Pigeon, Mallard, Pied Wagtail, Raven, Rook & Jackdaw.